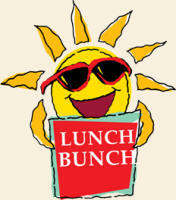 The Lunch Bunch meets the third Wednesday, eight times a year, at members' homes. We have a light and delectable lunch and enjoy stories and interesting conversation. Below and to the right is the schedule for 2019; lunches start at 11:30 a.m. Reference the sub list below and let the hostess know who the sub is if you are not attending. Our group began in 2003 and was formerly known as Luncheon Gourmets Dining In through 2007.